Little Elvis discovered the wonders of gravity a few weeks ago. But it took me a few days to actually catch this new trick on camera, a few more days to edit it and then two weeks to post it. So, he isn't really doing this trick all that much anymore. Oh well, it's still super cute. So Little Elvis wore his Santa hat just about every day that we went out. To clarify, I may live in northern Virginia, but I'm a true southerner. My son has to have a hat on his head whenever we leave the house. He also doesn't have much hair, so he honestly needs something to keep that sweet little head warm. I thought nothing of putting his Santa hat on him -- he wore it to church, (Is that bad? The preacher always complimented him.) to the grocery store, to storytime, etc. Pretty much everywhere we went, we got compliments. I had no idea that using a Santa hat as a toboggan was not common. About a week and a half before Christmas, my little man and I were going into Babies R Us. After our little accident with the carseat, I was carrying him everywhere. It was cold and windy. I had a heavy baby, his shopping cart cozy, his diaper bag, my purse, a coupon folder and had wrangled a wayward shopping cart. Since it was cold, I decided to wait until we got into the store to worry with the cozy. My hands were full. Someone was pulling into a parking spot as I trudged through the parking lot and she literally stopped her car in the middle of the lane. Here I am weighed down with everything but our kitchen sink, and this woman stops her van right in front of me! I said something to the effect of "Go Sweetie!!" And she finally pulled into a parking space. Thank God I didn't yell or say the evil words that were dancing through my mind. While I was struggling to get Little Elvis into the shopping cart, the lady driving the van walked into the store. She came up to my angel and told him that he was so adorable in his little Santa hat that she just had to stop and get a good look at him. How could I stay angry? We've been sharing our favorite Christmas memories. For some reason, Santa's reindeer were very important to me. I mean those guys helped a very chubby man transport a heavy sleigh full of toys all over the world in one day. If Santa was getting a snack, well those reindeer needed one as well. I remember setting out carrots, apples and oranges for them. We would put out 8 apples or carrots and one orange (Rudolph was special) for the reindeer. I know memories change with time, but I'm pretty sure that I got really upset one Christmas when the reindeer didn't eat any of my treats. And the next year a bite was taken out of each and every treat that I left. I also remember being so excited about Santa coming that I couldn't sleep. I would sneak out of my bedroom and tiptoe into the kitchen to look at the time on the microwave and then run back to my room. I usually passed out around 3 or 4 and my parents would have to wake me up on Christmas Day so I could enjoy my presents. Bob really enjoyed his Christmas routine. They would chop down their tree the week before Christmas and they wouldn't decorate it until Christmas Eve. He was the head alter boy and had a big part in Midnight Mass. After that, they would open all of their presents and eat breakfast at 2 a.m. and then sleep until noon. We've been talking about Christmas plans for Little Elvis. Both of us like Christmas carols, so maybe we'll try to get him to go caroling or something when he's older. Bob doesn't like to wait for his presents, so we used to open presents at midnight on Christmas morning. But that won't fly anymore. What are your Christmas traditions or memories? My mommy must have thought the song was "Deck the baby with clothes of Christmas." What, you've never heard of an Elvis reindeer? Daddy got to pick my headgear this time. The room was pitch black when Mommy took this. Somehow the flash didn't wake us up. I needed a little help opening my presents. It's gets tiring after a while! Where are the rest of my presents? I got a wheel barrow from my Gram and Coachpa! It's just the right size, too! What does a reindeer have to do to get food around here? Little Elvis has a new trick, but we're not quite sure what it is. He's been raising both hands over his head and bellowing "aaaahhhh!" Is he doing the wave? Signaling a touchdown? Conducting an orchestra? Singing for his supper? It's very possible he's doing is own version of the wave. Whenever we're watching football and the team I'm cheering for is losing, I make everyone in the room do the rally wave. Little Elvis has witnessed this wave, which has worked for Alabama and Mississippi State University. But, I don't know. Do you have any suggestions? I used to work in local television news. I was a producer. It was a sometimes exciting job, but there were definitely tedious parts of the job. That was the great thing about interns. The medical tapes were out of order? Have an intern organize them! Don't want to log bites from a super boring interview? Have an intern do it! There's a whole closet full of old tapes that need to be organized? That's exactly what an intern is for! I always felt perfectly justified for this outlook, because as an intern I spent a summer locked in a tiny room logging way too many tapes for a proposed show that never happened. Yep. All of my logging was for nothing. Are you wondering what logging is? It's where you watch a tape and write down what happens when. You use timecodes to do this. It's tedious work that doesn't require any real brain power. Why do I need an intern now? Not for the jobs you might think. I really don't mind the brainless work, like washing pots and pans and taking out the trash. It's nice to not think sometimes. Bob and I bought a camcorder the week before Little Elvis arrived. And we use this thing constantly. We decided to compile a video of Little Elvis' whole life for Christmas. And our video is not labeled or organized. It's just a series of numbers, letters and dates. That means one of us needs to watch all of the old video and write down what is recorded and where. Not only is this job tedious, it requires the computer. I can only use the computer when Little Elvis is napping or sleeping. This is why I need an intern. I need someone to watch some unbelievably adorable video of my baby and write down what happens. I'm not asking for timecode specifics, just basic descriptions to go with each bit of video. Have I mentioned that it's absolutely amazing how much he has grown and changed? I'm actually enjoying watching most of the video. Maybe I should stop complaining and wasting my precious nap time and get back to logging video of Little Elvis. Little Elvis got to visit with Santa three times this weekend! Santa visited a really cute store in our area on Sunday afternoon. I had been planning to take him to that for about a week. But the hotel we stayed in last weekend had a Santa on Saturday morning. Obviously, we couldn't pass up an opportunity for Little Elvis to meet with Old Saint Nick. After breakfast we took him down to sit (or stand) on Santa's lap. Yes, this Santa had a fake beard, but he had elves and reindeer. Obviously Little Elvis likes fake beards. One of the reindeer came up to me while I was taking pictures to tell me that she wasn't really a reindeer, she was just pretending. How cute is that? Little Elvis liked this Santa. He was pretty happy and didn't pout or cry. After visiting with this Santa, we went shopping. And, of course, we hit Wal-Mart. And there was another Santa. Little Elvis sat on his lap and pulled at his beard as well. We didn't have the camera, but he was just fine with this Santa, too. Then came Sunday. I took him to visit the Santa in our area. This Santa had a *real* beard! With glitter in it. He had bells. Little Elvis was not impressed. He started bawling the second I sat him on Santa's lap. One of the workers took my camera so I could hold Little Elvis. He still cried. He didn't even want to be near Santa! Oh well. As the song goes, "Two out of three ain't bad." But we went to visit my parents and Bob's dad this weekend, so we didn't get a chance to shop on Saturday. This is why Little Elvis and I went by ourselves. Why do I need help? Well, we typically hit 3-4 stores and use LOTS of coupons, plus our own bags. It's a lot to carry. All of that is a bunch of lead up. As we were leaving the final store, I pushed the cart down what I thought was a ramp. It wasn't. The front wheels of the cart slammed to the pavement and Little Elvis' carseat flipped backward and into the cart. He was belted in and there was an empty canvas bag in the cart. I screamed and, hearing my yelp, he started crying. A nice man helped me turn the seat over so I could unbelt my sweet baby and hug him. Little Elvis stopped crying as soon as he was in my arms. I checked him for any sign of injury, and there weren't any. Shakily, I pushed the cart to the car while carrying Little Elvis. I held him while I put the carseat and groceries in the car and pushed the cart back up to the store. Then I got into the backseat with him and called Bob. I was crying and Little Elvis cried some, too. I just felt so awful and guilty. Little Elvis is the best thing that's ever happened to me, and I scared him and almost hurt him. I kept apologizing to him for having such a crappy mommy. I have a shopping cart cozy, but it was in the other car and I was hoping Little Elvis would take a nap. And I'm pretty sure the carseat was properly attached to the cart, because I heard it latch. I told Bob I would always use the shopping cart cozy. He said Little Elvis was probably safer because he was belted in and the carseat belt is much more secure that the cart cozy. I think I might have been able to better see the lack of a ramp had he not been in the carseat. Anyway, it shouldn't have happened. Who doesn't see a ramp? This is a grocery store we've been to several times. How could I do something so careless? I am so glad our baby is fine. Little Elvis actually likes -- or seems to like -- most toys, foods, games and objects. This post will actually be pretty short. He hates napping. At least he hates the whole realization that he's about to be left in his crib by himself. I hear about these moms whose babies take 3 hour naps and wonder, "What am I doing wrong?" The abhorance of napping causes him to have issues with two other things -- the glider and the mechanized swing. He knows that these both should lead to naps and gets fussy when we he gets near them. Luckily we didn't spend too much on either of those items. He is usually really good about going to sleep at night, though. He is also a wonderful eater. We've only found one food that he wasn't super fond of -- cantaloupes. This was a food that I thought would be just perfect for him -- it's sweet, mushy and did so well in our food processor. It's the only food he's gagged over. I didn't see the point in forcing him to eat it. When he was a newborn, he startled at the sound of velcro. I was using a "Breast Friend" to help me with nursing. Luckily we both got better at nursing and I was able to use pillows or the Boppy. Velcro doesn't seem to bother him any now. There are other things that upset him, (like when I won't let him chew on my cell phone) but I'm pretty sure those upset most babies. Our camcorder -- We bought our camcorder a couple of weeks before Little Elvis arrived. We decided to spend a little more to get a hard-drive camcorder and I think it was a very wise decision. We love the size, picture quality, and ease of getting camera files on to the computer for editing. Most of the video that is on the blog was shot with this camera and edited with the basic software that came with the camera. Not to mention the fact that Little Elvis seems to love this particular camera as well -- he hears the little beep when it powers up and stops whatever cute activity he was engaged in (and typically why we reached for the camera in the first place), adopts his gregarious TV persona and his eyes never leave the lens. Storage ottomans -- We replaced the coffee table in our living room with a couple of ottomans for a couple of reasons. First of all, we were afraid that Little Elvis would hit his head on the hard wood or the sharp corners of the coffee table even with the protective corner bumpers installed. Secondly, in our tiny living room, the coffee table was taking up a lot of space without offering much in the way of storage. We replaced the coffee table with a leather ottoman and a plush ottoman, both with lifting lids that allow for storage of most of Little Elvis' toys. They double as toyboxes, are the perfect height for our little cruiser and his little head has remained unscathed thus far. Slappy and Wally -- Our cats, it turns out, were good parenting practice for Mere and I. No, we never diapered them or pushed them in strollers, but we've always played with them and given them a lot of attention. While they've taken a bit of a back seat in the past year, they are now getting more attention than they want from Little Elvis. He likely sees them as stuffed animals that play with him, rather than just sit there. In most cases, they are just trying to stay out of his way (especially Slappy), but are very tolerant of his petting (especially Wally). They'll become fast friends in coming years. Little Elvis' guitar -- Okay, I love to play the guitar, so I bought a guitar for Little Elvis (recommended for ages 7 and up) months before his arrival. When he was really small I would play it for him occasionally. Now that he can crawl and stand, I bring it down for a little while every day. He likes to kneel or stand, using the guitar (that I'm holding) for balance. He flaps his arm and strums the strings and seems to really enjoy it. He occasionally channels Jimi Hendrix and tries to bite the strings, but I generally discourage this behavior. His latest thing is to look at the guitar from the front (the body of the guitar looks like a soccer ball), then lay down and turn halfway over to see the back of the guitar, which is blank. I think he's discovering that one object can look different on its two sides -- pretty smart little dude! Soap bubbles -- This one is mainly for me (and Slappy, our cat). Little Elvis will pop a couple if they sit on the floor, but I could blow bubbles for him and Slappy all day. If nothing else, it is a bonding experience as it brings Slappy about as close as she will voluntarily come to Little Elvis. Welcome home, Daddy! -- I'm not sure if it's one of Little Elvis' favorite parts of the day, but one of my best moments each day is walking in the front door of the house each evening. If Little Elvis is within view, he lights up and gives me a big smile. If he can't be seen, but is within earshot, all I have to do is call his name and he crawls within view in a matter of seconds. Rock-a-bye baby -- Little Elvis has troubles sleeping from time to time. We've read (and found that it is true) that it is best for the father to attend to a crying baby at night, so that midnight snacking is not an option. I pick our crying little boy up and rock with him for 10 to 20 minutes. I don't let him wiggle very much, don't talk or sing to him, and for the most part don't even look at him. I also don't really think about the sleep I'm missing -- all I think about how important it is to get him back to sleep so that he can get his proper rest. Being able to get him to sleep at these times makes me feel important -- most of his other physical needs are met by Meredith. I can contribute in this little way and that makes it one of my favorite things. Now you know what Little Elvis loves, but I want to share my favorites, too! We bought a carseat cover at a baby sale when I was pregnant. It's double-sided, Eddie Bauer and fits snugly around his little carseat. It was great right after he was born. He looked so sweet and snug in the carseat, and it definitely kept him in a cocoon of warmth. Now that we're back into cold weather, Bob and I decided to give the carseat shield another try. It's a bit tight, but still works pretty well. It's so cute when he pops his head up out of the little opening. We also liked the Bumbo. I know it was recalled, but it worked really well for us. The thing is, we only used it for about 2 and a half months. As soon as he started sitting fairly well on his own, we put it up. Another big favorite of mine is the swinging baby gate. It had two options -- we could attach it to the wall and let it swing like a door, or just use it like a regular baby gate. Bob installed it a couple of weeks ago and I absolutely LOVE just swinging it open when I need to pass through. I still step over occasionally, but I usually just swing it open. Finally, I really enjoy singing silly songs for Little Elvis. He has a whole ouevre of songs specifically about him. I'm not a musician, so they are basically regular songs that I stick his name and accomplishments into. He really likes "Little Elvis lies over the ocean." It's just "My Bonnie lies over the ocean" with his real name used in place of Bonnie and "We love you Little Elvis" (a take off of the "We love you Conrad" part of the overture from Bye Bye Birdie) and who can forget my amazing rendition of the "One" from "Chorus Line." I even went so far as to put his name in the Oscar Mayer "My bologna has a first name." I told Bob that when Little Elvis goes to pre-school he's going to be so confused when he hears the real lyrics to all of the songs I've changed. I'm sure I like lots of other things, but these are the ones I remember. Bob is going to weigh on his favorites next. Little Elvis has lots of real toys that he plays with everyday. But he also has lots of non-toys that he's found to be just as, if not more, fun. He adores his aspirator. I know that's gross. It's clean... now. At first he just chewed on the bulb part and held the pointed end, kind of like he was working on a lollypop. Then, he decided the pointed end was just as much fun. I tried to take his nose aspirator away and give him an oral one that we had never used. He prefers the nasal one. We got a three-pack of silicone basting brushes and gave him one. Oh, he likes this thing. He likes to lather it up with as much slobber as possible and then fling it everywhere. Sometimes I "paint" him with this brush. He gets the happiest grin on his face when I do this. Bob decommissioned one of our remotes so Little Elvis could have a real one to play with. Bob took the batteries out and taped the back on. At first Little Elvis liked this a lot, but then he realized that it wasn't the remote Mommy and Daddy used. He prefers the real remote. Little Elvis has also developed a thing for my necklaces and bracelets. I had a couple that I thought were "indestructable." He managed to destruct one, but he hasn't figured out how to affect the others... yet. He loves the belts that keep him secure on his changing table, in his carseat and on his high chair. He fusses when I lay him down to change him, but changes his tune as soon as that belt is snapped closed. And he can stand up by the high chair for minutes at a time, just pulling at the belt tabs. Maybe it's the texture of the belts? Who knows. We saved one of his family pack diaper boxes, and Bob pulls him around the house in it. Little Elvis seems to have so much fun when Bob does this. He discovered the flushing mechanism on the toilet on Sunday. He played with it while put on my make-up. I didn't think he could actually flush the toilet. He did, and once he heard that fun noise, he wanted to hear it more. Now I have one more thing to shield from him when we go to the bathroom... yay. I made him his own little drawer in the kitchen, full of his dishes. We put a finger guard on it and he was pretty happy with that drawer and the dishes. But he managed to catch his finger between the drawer and the wall last weekend. I can't think of a way to keep that from happening, so we've cordoned off the kitchen for now. He hates this. When he would tire of his drawer, he would crawl over to our vegetable bin and rub his fingers on the mesh covering the bins, and possibly chew a tomato. Now he has to just stand at his gate and cry until I leave the kitchen. It's not fun for either of us. I guess his biggest non-toys would be the cats. How he loves the cats. Slappy still won't get near him, but Wally is too stubborn and lazy to move. So Little Elvis gets to pull on fur, whiskers, a tail, basically whatever he can reach. Little Elvis has many more likes than dislikes. He can find something interesting in just about anything, especially something that Mommy and Daddy are holding. But some toys stick out more than others. 1. One toy that's been a favorite since about 3 1/2 to 4 months is his Baby Buzzr. This toy can vibrate, play music, and its eyes will even flash red. Little Elvis can grip onto the rubbery side teething things and turn the music, vibrations or eyes on at will. It's great for car trips. He likes to play with it while he's in his car seat, and we don't have to listen to it too much for it to really get on our nerves. I bought it at a baby consignment sale, but I've seen them at TJ Maxx for around $5. 2. Another favorite is his exersaucer. We got a 3-in-1 Evenflo Exersaucer from some of my mom's friends. This contraption entertained Little Elvis when he was an infant, and once we assembled it for him to sit and swivel, he had the best time. We've upgraded it to the 3rd stage - this stage requires him to stand up -- and he seems to like it even more. 3. The Fisher Price Activity Walker has become a fast favorite. As soon as our little guy started standing and cruising, he realized just how fun this toy can be. It's become one of his favorite daily activities. He looks so proud and pleased with himself when he's cruising around the living room. 4. He also loves his stacking rings. These are a relatively new love for him. He doesn't like to stack them, but he absolutely loves to unstack them as Bob and I stack them. 5. We got him Playskool's Melody Mixin' Drum Set for his 6 month birthday and he seems to really like it. I think he likes it for the same reason he likes the stacking rings, except he can put the little musical toys into the drum as well as take them out. The songs change as he adds or takes away the musical toys. I'm not sure he realizes that, but he enjoys putting them and pulling them out. 6. He loves books, but we've discovered that the only ones we can use around him are ones that are plastic or fabric. He likes to turn the pages and chew on the edges and wave them up and down. 7. Bouncy balls are also a fun part of his day. He has a big ball that he can he likes to grip with both fists and a smaller one that he can hold onto more easily. These were great when he was first learning to scoot and crawl because they would roll away from him and he would chase them. Now he likes to grab them and shake them up and down. 8. He also loves his plastic dump truck. He rolls it around and shakes it up and down as well. Shaking just about anything is lots of fun. 9. Bob likes to blow bubbles for Little Elvis every evening. Little Elvis likes to hunt down the bubbles that land on the floor and pop them. At first I thought Bob did the bubble thing for himself, but Little Elvis has really taken to them. 10. 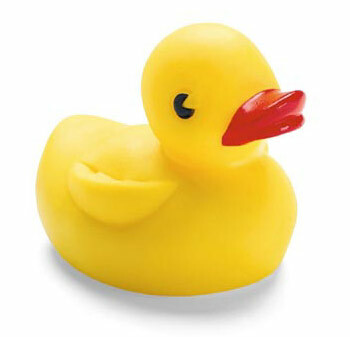 Last, but certainly not least is his rubber ducky. He has a mommy ducky that he takes his bath with each evening and two baby duckies -- one in the diaper bag and another just in with his regular toys. The baby duckies fit perfectly in his little hands and his little mouth. The mommy ducky easily fits within both hands and is also pretty tasty. There you have it, Little Elvis' favorite real toys. He also loves lots of random objects. I'll write about those tomorrow. Little Elvis has lots of favorites. Actually, we all have favorites. I thought that this week, I'd try to do several posts about all of our favorite things. I realize all babies are different, but I thought some of our favorites might help others. A big favorite for the whole family is music videos. Without further adieu... "Little Elvis' Favorite Things."